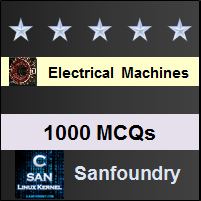 This set of Electrical Machines Multiple Choice Questions & Answers (MCQs) focuses on “Open Circuit and Short Circuit Test”. Explanation: The power measured while conducting the tests is the winding losses and the core losses. Explanation: OC test gives the shunt branch parameters as well as the turns ratio by connecting a voltmeter at open circuited secondary terminals. Explanation: Series parameters are obtained by short circuit test results. 4. Which of the following informations are obtained from short-circuit test? Explanation: Core losses are found from OC test . 5. Which of the below estimations require results of both open circuit test and short circuit test? Explanation: All the estimations asked will need results of both the tests. Explanation: OC test is performed on the l.v. side of the transformer because the l.v. winding will have lower stress on the insulation and no damage will occur. Explanation: To circulate the rated current in the winding, we should opt for lower value of the current so that winding will not damage. 8. A single phase transformer of 2200/220 V having rated l.v. current of 150 A has to undergo open circuit test on h.v. side.Which of the below instruments range should be used? Explanation: Open circuit test is conducted on l.v. side, so the measuring instruments will be on the h.v. side. So the current in the h.v. side will be around 3-6% of the rated. 9. A single phase transformer of 2000/200 V having rated l.v. current of 100 A has to undergo short circuit test on l.v. side. Which of the below instruments range should be used? Explanation: Short circuit test is conducted on h.v. side, so the measuring instruments will be on the l.v. side. Rated current on the h.v. will be 10A and voltage will be around 5-12% to account for winding losses. Explanation: The current in the h.v. winding will be around 10 A but the ammeter is of 1 A rating. So, it will burn off. 11. Which of the following conditions have to ensured for a short-circuit test? Explanation: For conducting short circuit test, l.v. winding is short circuited and it is not performed at rated voltage. 12. Which of the following conditions have to ensured for a short-circuit test? Explanation: The feature of the high impedance is extracted in the arc welding applications. 14. Which of the following conditions have to ensured for a open-circuit test? Explanation: Leakage impedance is not found from open-circuit test. 15. Which of the following conditions have to ensured for a open-circuit test? Explanation: Leakage impedance is not found from open-circuit test. And it is performed on the rated voltage to account for core losses. 16. Which of the following informations are not obtained from short-circuit test? Explanation: Core losses are found from OC test and the voltage regulation is not obtained from one single test here.